The planet arrogantly dubbed “Earth” by its dominant terrestrial species might more accurately be called “Sea”. Seven-tenths of its surface is ocean, yet humanity’s need to breathe air and its inability to resist pressure means this part of the orb is barely understood. In June a project designed to help correct that will open for business. 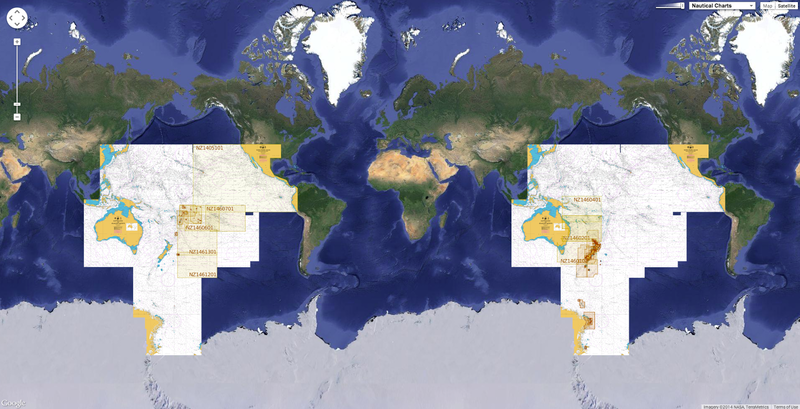 The seven sites of the United States’ Ocean Observatories Initiative (OOI), scattered around the Atlantic, Pacific and Southern oceans, will measure physical, chemical, geological and biological phenomena from the seabed to the surface. They will join three similar Canadian facilities, VENUS and NEPTUNE in the Pacific, which have been operating since 2006 and 2009 respectively, and the Arctic observatory in Cambridge Bay, an inlet of the Arctic Ocean, which opened in 2012. The American project was conceived jointly with Canada, which secured funding first. Canada’s near decade-long operational experience should help to provide pointers to make the bigger operation a success. The OOI’s metaphorical flagship is the Cabled Array, which is being deployed off the coasts of Oregon and Washington, to the south of VENUS and NEPTUNE, with which it will collaborate. In particular, these observatories have a remit to study a suboceanic piece of the Earth’s crust called the Juan de Fuca plate, which is being overridden by the North American plate’s progress westward as part of the stately geological dance called plate tectonics. 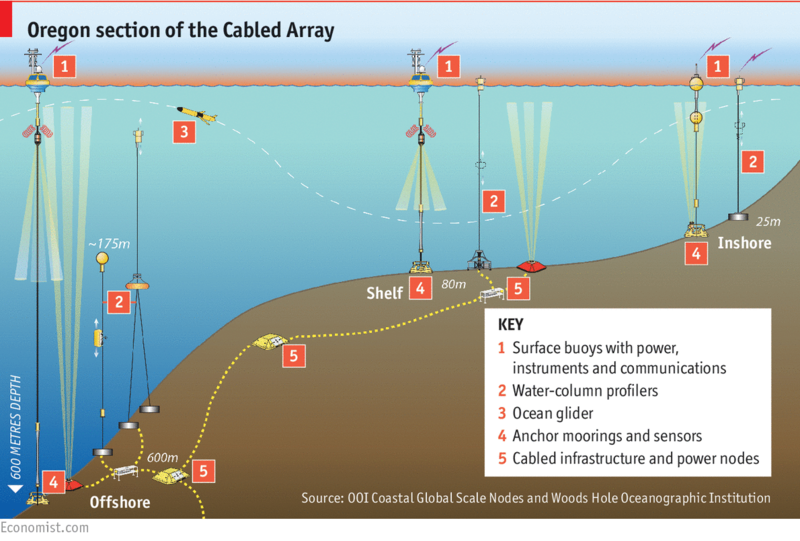 As its name suggests, the Cabled Array is organised around a submarine cable—a 900km-long power and data connection between its base in Oregon and its seven submarine nodes (see illustration). These nodes are linked, in turn, to 17 junction boxes that distribute power and signals to the system’s instruments, and collect data from them. It is also connected to “profiler moorings” that let instruments travel up and down a wire stretching from the surface to the bottom, allowing a cross-section of the water column to be sampled at regular intervals. One of the Cabled Array’s jobs is to measure the Juan de Fuca plate’s volcanic and seismological activity, including the output of its hydrothermal vents—submarine springs from which superheated mineral-laden water emerges. These support very unusual forms of life which are not found in any other habitat. It will also, though, study more quotidian matters, such as ocean currents and chemistry, and the biological productivity of the area. The other six observatories are tied to moorings and are powered by battery, sun and wind. They will send their data ashore via satellite. Like the Cabled Array, each has at least one profiler mooring and also a range of instruments at various fixed depths. These moored observatories, though, can reach out beyond the range of their fixed instruments using robots. 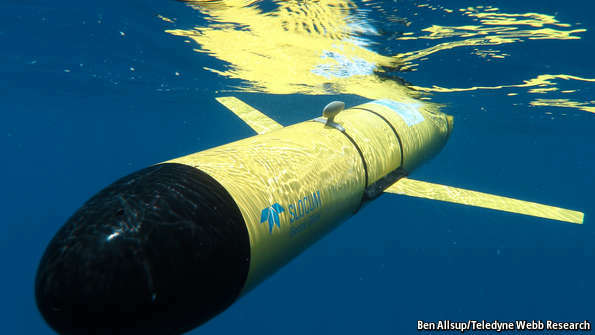 Most of these robots are torpedo-shaped ocean gliders (one of which is pictured above) that “fly” long distances through the sea, sampling sunlight penetration, chlorophyll and oxygen concentrations, and the density, pressure, temperature and salinity of the water. The ocean gliders travel by slowly decreasing their buoyancy to sink, and then increasing it again to rise. The hydrodynamic shape of their wings means that both rising and falling drives them forward at a leisurely rate of about 1.5kph. One observatory, called Pioneer, is also equipped with propeller-driven autonomous underwater vehicles (AUVs), that can swim more strongly against currents. It is one of two moored close to shore—in its case, the shore of New England. The other, Endurance, is off the coast of Oregon. Both will measure processes such as upwelling (important for the recycling of nutrients that have fallen to the seabed), oxygen depletion (which is often caused by pollution), and the dramatic changes in water temperature, salinity and currents that happen where the continental shelf dives into the abyss. The remaining four observatories are stationed in deeper water. At their sites the seabed is between 2,800 and 5,200 metres below the surface. Irminger Sea is next to Greenland; Argentine Basin lies in the South Atlantic; Southern Ocean is stationed off Chile’s southern tip; Ocean Station Papa is in the Gulf of Alaska. Each of these observatories will sit at one corner of a triangular study area with sides up to 62km long, the other corners of which are occupied by fixed daughter stations. Each study area will also be patrolled by gliders. In combination, the OOI’s seven observatories will carry 830 instruments, including 32 gliders and three AUVs. The wealth of data this equipment produces will be funnelled back to Rutgers University in New Jersey and then, as is increasingly required of science, made immediately available to all and sundry. This is, after all, a taxpayer-financed project—to the tune of $385m for the construction alone. Not everyone is happy with such open access. Some old-school oceanographers worry that they will work on a question thrown up by the data, only to be scooped. Many, no doubt, are more used to going to sea to collect samples than having data delivered to their desks. A report earlier this year by America’s National Academy of Sciences was less than enthusiastic about the OOI. It found “a lack of broad community support for this initiative, exacerbated by an apparent absence of scientific oversight during the construction process”. That absence, though, was probably one reason the project’s co-ordinators, a not-for-profit group called the Consortium for Ocean Leadership, managed to adhere to the OOI’s construction timetable. Having a plan and sticking to it without other people shoving their oars in always makes it easier for contractors to meet their deadlines. Whether such punctuality has been bought at the expense of scientific effectiveness remains to be seen. And failures there will no doubt be. VENUS and NEPTUNE have suffered from corroded instruments, underwater landslides and damage from trawler nets. Canada has learned from these problems. For instance, it now discuss the project with fishermen and points out where equipment is located. Some researchers also think the OOI is short on staff. Canada’s observatories have five researchers overseeing 180 instruments. The OOI’s 830 will be overseen by a mere quartet. Undersea observatories are ambitious projects, so it will take time to get them right and attract people to use the free data. One way the organisers hope to entice users is by putting instruments on Axial Seamount, an underwater volcano about 480km west of Oregon that could erupt at any time. Being able to monitor an undersea eruption live would be exciting—and not something conventional research methods could manage. There is nothing like a firework display to attract a crowd. 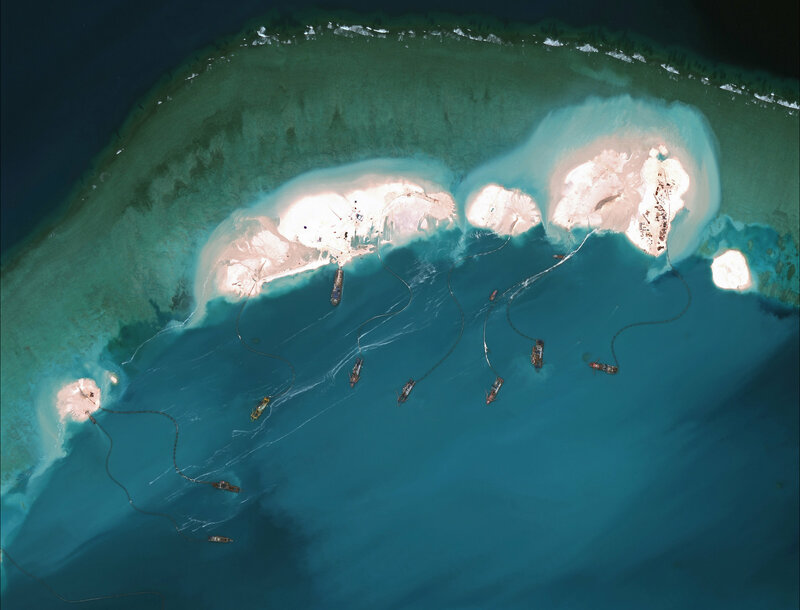 A satellite image from March 16 shows work on an emerging artificial island at Mischief Reef in the South China Sea. The clusters of Chinese vessels busily dredge white sand and pump it onto partly submerged coral, aptly named Mischief Reef, transforming it into an island. Over a matter of weeks, satellite photographs show the island growing bigger, its few shacks on stilts replaced by buildings. What appears to be an amphibious warship, capable of holding 500 to 800 troops, patrols the reef’s southern opening. The Chinese have clearly concluded that it is unlikely anyone will challenge them in an area believed rich in oil and gas and, perhaps more important, strategically vital. Last week Adm. Harry Harris, the commander of the United States Pacific fleet, accused China of undertaking an enormous and unprecedented artificial land creation operation. Defense Secretary Ashton B. Carter, on his first trip to Asia, put the American concerns in more diplomatic language, but the message was the same. In an interview to coincide with his visit, published Wednesday in the Yomiuri Shimbun, one of Japan’s largest dailies, Mr. Carter said China’s actions “seriously increase tensions and reduce prospects for diplomatic solutions” in territory claimed by the Philippines and Vietnam, and indirectly by Taiwan. That is the same diplomatic message the Obama administration has been giving to China since Hillary Rodham Clinton, then the secretary of state, and her Chinese counterpart faced off over the issue at an Asian summit meeting in 2010. A Chinese facility on Hughes Reef in the South China Sea. The transformation of Mischief Reef, which the Chinese call Meiji Reef, she said, is within territory claimed by the Philippines and is one of seven small outposts the Chinese have sought to establish in the South China Sea. “These will allow Beijing to conduct regular, sustained patrols of the airspace and water, and to attempt to press its far-flung maritime claims as many as 1,000 miles from its shores,” she said. The issue poses a problem for the Obama administration, not simply because the Philippines is a treaty ally. China is working so quickly that its assertion of sovereignty could become a fait accompli before anything can be done to stop it. The southern platform has been further expanded using sand recovered from the reef's southern entrance. The entrance itself has been expanded to a width of approximately 275 m.
The United States has long insisted that the territorial disputes be resolved peacefully, and that no claimant should interfere with international navigation or take steps that impede a diplomatic resolution of the issue. But to the Chinese — already flexing muscle in other territorial disputes and with the creation of an Asian infrastructure bank to challenge the Western-created World Bank — this is not a matter for negotiation. It seemed to be a reminder that its military could make sure no one would dare challenge its building spree on disputed territory — and so far, no one has, other than with diplomatic protests. Satellite imagery of the Spratlys publicized by IHS Jane’s in November showed how the Chinese had created an island about 9,850 feet long and 985 feet wide on Fiery Cross Reef, about 200 miles west of Mischief Reef, with a harbor capable of docking warships. IHS Jane’s said the new island could support a runway for military aircraft. The United States is about to conduct a joint military exercise with the Philippines, part of an emerging Obama administration strategy to keep American ships traversing the area regularly, a way of pushing back on Chinese claims of exclusive rights. The administration did the same when China declared an air defense zone in the region more than a year ago. 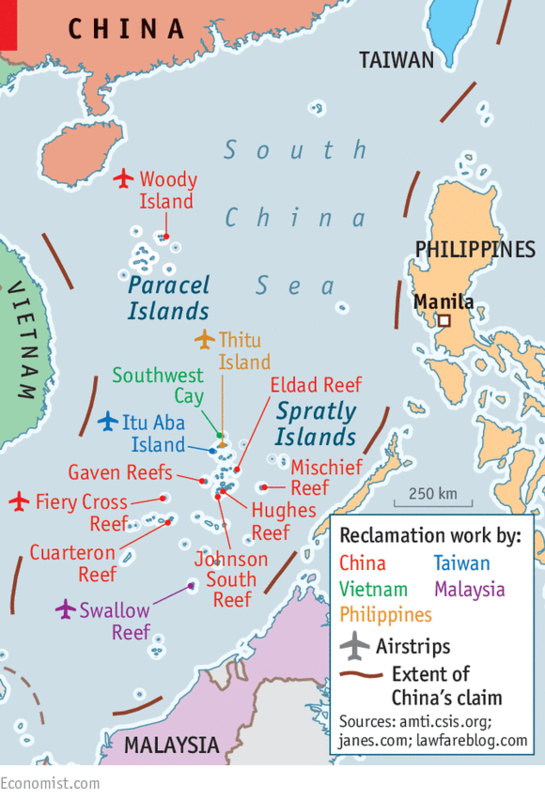 The Chinese have said they consider most of the South China Sea to be rightfully theirs — a claim others make as well. China and Japan have a separate territorial dispute over islands that Japan calls the Senkaku and China calls the Diaoyutai. Those tensions have eased slightly in recent times. Last year, China and Vietnam became entangled in an angry exchange after China towed a $1 billion oil drilling rig to an area 150 miles off Vietnam’s coast. Light The Ocean is an entirely new perspective on the ocean world. 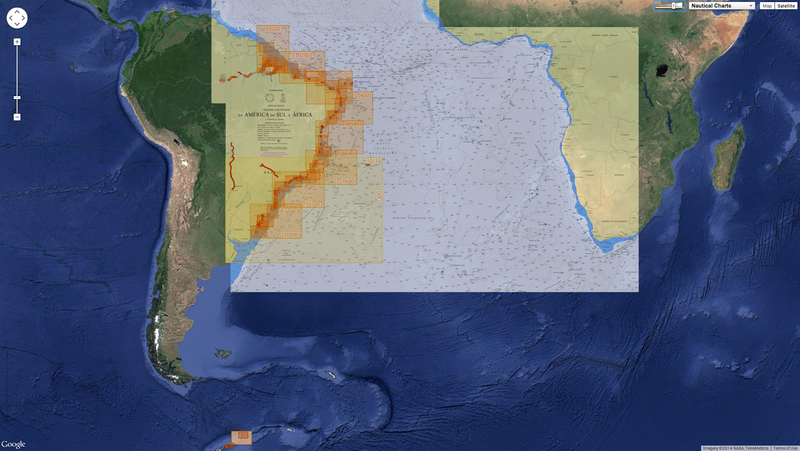 By combining data from scientists around the globe with specially developed computer animation software we are able to turn the waters of the ocean crystal clear. We reveal spectacular underwater landscapes and hidden structures in the ocean itself. We show how landscapes and water interact on unimaginable scales to create an ocean world as diverse in habitats as anywhere on dry land. Our camera crews have also traveled the planet, from the Antarctic to the deep waters of the mid-Atlantic to capture spectacular new footage of the creatures that depend on these ocean habitats.